The contents of Legend of Zelda games are dense, and “Iwata Asks” needs to be dense too, so this time I would like to ask about both the volcano and enemy monsters. 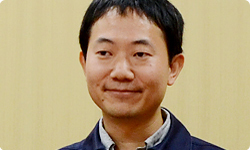 Except for Fujibayashi-san, who participated in the previous sessions, would you please introduce yourselves, stating what you worked on for this game? Sure. 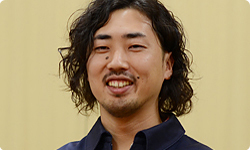 I’m Tominaga from the Entertainment Analysis Division (EAD). I mostly worked on the volcano game field and the planning of the dungeons. Yes, that’s right. Thanks for having me here today. I’m Kiuchi, also from EAD. I mostly designed the enemies. You made the enemies, including the ones that appear at the volcano. I’m Oyama from EAD. I lent support to the designers and worked on various effects. 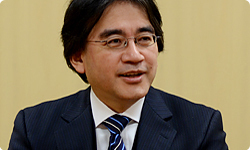 It was quite awhile ago, but you participated in our session of “Iwata Asks” on The Legend of Zelda: Twilight Princess. Yes, about five years ago. Okay, Fujibayashi-san, there’s a volcano game field. Why did you decide to make a volcano? We made the forest game field that we talked about last time on a mostly flat basis, but a game field making use of ups and downs would also provide a wide variety of gameplay. A mountain was the obvious place for that. Why a volcano and not just a mountain? When The Legend of Zelda comes up, I think of the old volcanic area of Death Mountain. We chose a volcano because that provided lots of ideas for gameplay. It has lots of possibilities, so when you were put in charge of the volcano, where did you start, Tominaga-san? This time you can perform a new action called Dash, so I thought if I combined that with a volcano, with its ups and downs, I could make something fun based around slopes. You wanted to make landforms that would require use of the Dash feature. Video: With Dash, you can even scramble up steep mountain slopes. With Dash, you can even scramble up steep mountain slopes. I wanted to make it so that once you did that, you could look down from up high. I think you could climb up high and look at the view fairly often in the series before. What makes this different? There’s no interruption in the pace. In the series so far, when we made a mountain path, it had to be in a zigzag pattern, so it took time to climb someplace high. Now Link can use Dash to run up, so that is no longer the case. There are some very scenic viewpoints. Yes. And even if you don’t go all the way to the peak of the volcano, you can check out the view from partway up. Usually, you would just climb a single path to the top and then continue on, but this time I wanted players to be able to stop partway, turn around, and relax as they enjoy the scenery. The A Button opened up, allowing Link to Dash, which led to including more slopes, and the result of that was being able to enjoy splendid scenery - but at first glance, all those things may seem unconnected. Isn’t that mysterious? It is. The next thing I knew, we had included those fun elements. It was a very refreshing feeling as I worked on the game to see how adding one new action for the players allowed further new elements still. What other features of the volcano did you use? there’s lava bubbling up, not just in the dungeon, but all around the game field . In some places the lava goes up and down, and in some cases you have to empty it in order to move on. And... Oh, I’d better not say any more. That’s something to enjoy when playing the game? Yes. (laughs) We were able to include puzzles and gameplay characteristic of The Legend of Zelda everywhere. Oyama-san, you were in charge of various effects. What did you think as you made the volcano landforms? There is no one particular thing that I focused on because it’s a volcano, but with regard to effects for the player-character, I spent a long time on and tried a number of effects for when Link falls into the lava. Until now, when Link fell into the lava, it looked a little painful. Yes. 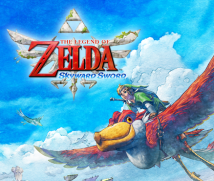 We represented it relatively seriously in The Legend of Zelda: Twilight Princess1, but this time, in The Legend of Zelda: Skyward Sword, it isn’t as serious as it was in Twilight Princess, while also not being as comical as in The Legend of Zelda: The Wind Waker2. 1The Legend of Zelda: Twilight Princess: An action-adventure game released for the Wii console and Nintendo GameCube system in December 2006. 2The Legend of Zelda: The Wind Waker: An action adventure game released for the Nintendo GameCube system in December 2002 in Japan. The art is different than ever before. Yes. Early on in development, it was similar to Twilight Princess. Then some staff members said, “This time it should be different,” and “It doesn’t feel right.” Being too serious didn’t fit the art this time. For example, when an enemy gets you in a Super Mario game, it doesn’t feel unpleasant. That’s right. So this time, we paid attention to making it so you say, “All right, I’ll try again!” and feel like giving it another go. I listened to everyone about how Link should move when he falls into the lava and readjusted it again and again. We decided to make it look like Link was very hot rather than in pain. That way it doesn’t feel unpleasant and you will try again. I see. I feel like that is something that you could say with regard to the theory behind the design of the whole game this time. I suppose achieving a balance between the realism - the photorealistic world - of Twilight Princess and the more cartoonish world of The Wind Waker was an incredibly important guiding principle this time. It certainly was. It would be jarring if a certain effect didn’t blend in well. Video: He jumps up! (laughs) And his green tunic catches fire! He jumps up! (laughs) And his green tunic catches fire! It’s a little on the comical side.